So a post 17 days Late. IT was my first concert, the kind possibly classified as rock concert, though think they are classified as alteranative rock. Was extremely excited. Furthermore, had the most interesting friends to go with, Kary, Jereme, Dinesh and Jan. For those who know me in biomed quiz: yes it's the Dinesh that said pneumothorax when we were presenting our PBL on peptic ulcer. The concert started with Youth Group warming us up. And well i guess i dun noe much of their music. Except their resing of Forever Young. And we waited soooo long for Coldplay to actually come out after them. Noticed that Chris Martin's MTF on his piano (see my photos) which is actually Make Trade Fair. And the ignorant me dun noe anything bout it, while Kary knew well what it was. Seeing them do their sound check, and all the equipment shifting and setting up, sure did remind me of the good old days of P.A. Crew. Sure miss those times and people, where i got to see free concerts. So it started. WE were standing about 4 rows from the stage. The lighting effects were amazing, Lasers used in Clocks, The large screen behind used for almost every song. and the play of shadows, creations of silhouettes. Music: need i say anything. 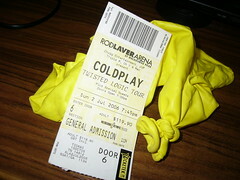 It was the closest i got to Coldplaying ever, live music. A chance to hear our own voices at times. It was stupendous, it was stupefying, it was perfect. Many times a zap of excitement sprints doen my spine, almost tingling and numbing. The songs were mostly from X any Y, but had the few older ones: Yellow, The Scientist, A Rush of Blood, and many i can't remember. Yellow had massive yellow baloons running down the audience. Yes, it's in theis pic i took.